Hosting a police safety chat would be a great idea for a guest speaker demonstration for your moms group! – Fingerprint Program: Heaven forbid something should ever happen to one of the children, we’re asking for information on the fingerprint program and missing children package we’ve heard is available from the local police station. – Stranger Danger: We’d like more information on how to teach the children about how to handle strangers and staying safe. – Play Safe: We’d like the police to talk to the children (those who are a little older and can understand the safety talk) about the importance of staying in the yard when playing and not leaving the yard without a parent. The police service will be sending out two officers from the school resource program. 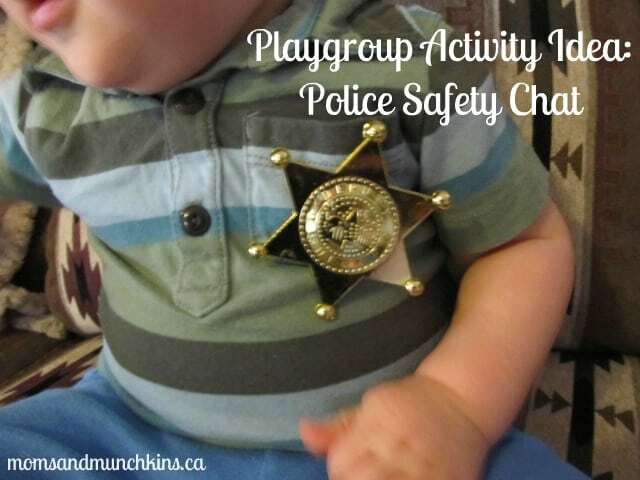 Once we have our police safety chat (mid-January), I’ll update you on how it went and any suggestions for having a similar event for your own moms & munchkins group. The police safety chat went really well. The older children that were in attendance were able to ask questions and answer questions with the police officers. The children were given safety coloring books as well. The police were excellent to talk to and provided great tips that we could all use. They also brought out a fingerprinting kit so parents could have their children fingerprinted if they wanted to have this to store at home. For more fun ideas to enjoy with your mom & tot group, follow along on Facebook. We look forward to seeing you there!